Louth in Bloom is a competition set up to encourage residents to maintain floral displays, to keep litter off the streets and to bolster civic pride. Judging will take place on Friday July 6th. Ark Animal Rescue in North Somercotes are looking for a home checker in the Louth area. According to Barbara Pearce the work amounts to "an hour of people�s time whenever an animal is being re-homed in the area for them to check the home will be suitable, filling in our home check form at the house, reporting back to the Ark and doing a follow up visit some weeks later to check all is well. I induct new home visitors so would be willing to go through it all with anybody interested and supply the paperwork needed. The frequency folk will be needed will depend on how many animals are being adopted at a given time and where they�re going. It�s very spasmodic but won�t ever amount to giving much time a week, and some weeks there�ll be none." The organisation is also in need of cat and dog food and pet bedding, as well as cleaning supplies, If you have any to spare the drop-off point in Louth is at Buckets Equine & Pet Foods at Unit 17, Station Industrial Estate, Newbridge Hill. This is currently the only collection point in town, and due to the price of fuel the organisation can't go house to house to make collections, so they would like to hear from anyone else who has space to store donations for them. Can you help them out? Because Louth has so many cultural festivals in summer, the Louth Town Partnership has decided to rebrand them. The 0 � Festival will take in the Louth food, music, and Spout Yard art festivals, and choral events in St James, and it will run from 23rd June to 15th July. Alan Mumby, chair of the Louth Town Partnership Festival committee, explained the reason for the new name: "We decided on O � partly because we feel not enough is made of the fact that Louth is on the Greenwich Meridian Line, bestriding the eastern and western hemispheres. And it�s an �off the wall� name that will get people talking, which is what we want!" Samantha Phillips, Louth Town Partnership Coordinator, is calling for people and organisations who want to take part in the festival to get in touch by calling 07917628149 or emailing samantha.phillips@e-lindsey.gov.uk. 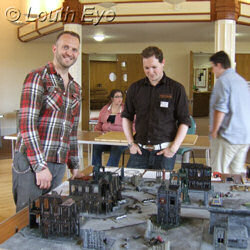 On Sunday June 10th the Louth Strategy Games Club held an open day at the Trinity Centre. On the left are pictures from that event. 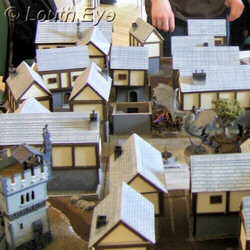 It was a free evening to introduce new people to the range of games and activities that are on offer. Neil Roberts, and artist whose work has appeared in 2000 AD and on the Black Library Horus Heresy books, turned up to learn more about the games he often illustrates. Take a look at his portfolio website Skinny Elbows if you want to understand why some people were a little star-struck.